We have a wide selection of ladies front desk hotel uniforms. We offer ladies blouses, shirts, vests, jackets, and pants for every front desk application at your resort hotel. 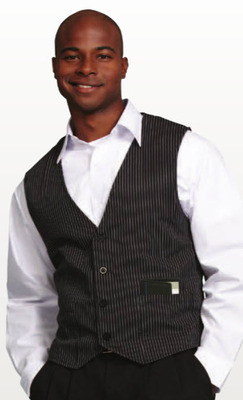 We have a wide variety of men's front desk hotel uniforms. 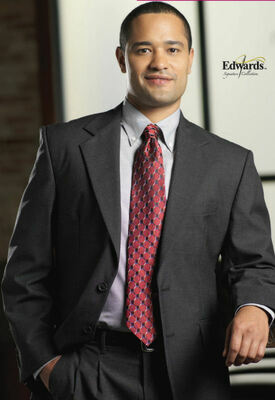 We have the look for the front desk, whether it be casual or very formal resort hotel uniforms. 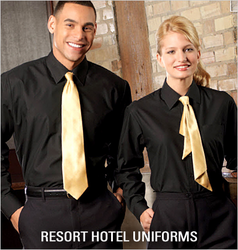 We offer a wide variety of Restaurant and Banquet Hotel uniforms. 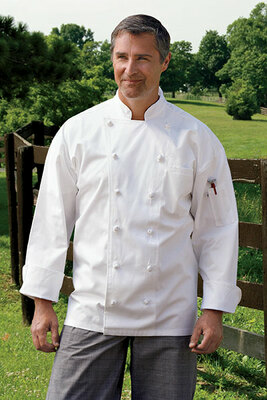 From Bistro aprons, embroidered polos, casual shirts, to formal attire such as tuxedo shirts and jackets. We offer very functional Housekeeping Uniforms, cool garments for the Housekeeping department for both women and men. The latest trend in upscale Resorts and Hotels is the addition of high end spas. We have a fantastic selection of Spa Uniforms for your new or existing spa. Our Industrial Work/Maintenance/Engineering hotel uniforms are designed to work as hard as you do. All our apparel is industrial strength with added features such as Soil Release, Moisture Wicking and Wrinkle Resistant qualities. 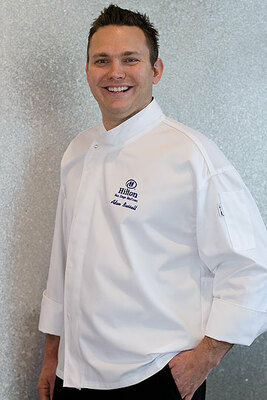 We offer a full line of kitchen uniforms, from the Master Chef to the Line Cook. From the show coat to the every day working coat. Chef Pants, Cook's Shirts, Kitchen Aprons and Headgear. We even offer highly requested women chef jackets. We can outfit your hotel front of the house from head to toe with stock or customized doorman uniforms. We have formal to casual attire for your Doorman and Bellman. When outside, we have a full line of outerwear to protect the front of the house from the outside elemnets. 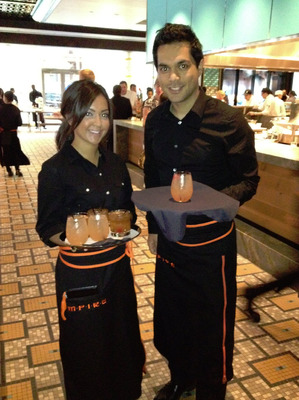 Make sure your hotel staff make a great first impression by dressing them in uniforms from Sharper Uniforms. Our selection of premium resort hotel uniforms are designed to keep your entire staff looking their best. From the front desk to the maintenance crew and everyone in between, we carry the uniforms and garments they need to put their best foot forward. Our uniforms for hotel staff are functional, comfortable and durable. Averill's Sharper Uniforms serves many of the best-known resort hotels with our unique uniform programs for each department. We carry uniforms and accessories for the front desk, restaurant staff, banquet servers, housekeeping staff, maintenance workers, pool staff, spa staff and valets. Because there are so many workers in a hotel that require a uniform, cleaning costs can add up. But not anymore! With the advent of newer fabrics with built-in stain-resistant properties, Averill's Sharper Uniforms now provides many Resort Hotels with washable suits for front desk personnel. These suits are comprised of suit jackets, pants, skirts and vests. The staff simply turns the garments inside-out, and they can be washed in a home type washing machine, industrial machines are not needed! Many hotels are located in four season environments. Sharper Uniforms offers a complete line of sweaters made of different fabrics, weights and colors to keep hotel staff warm when the weather turns cool. To complement the sweater line, we also offer durable outerwear consisting of everything from light wind breakers to heavy four season jackets. Our outerwear comes in a variety of colors and weights to match the climate. 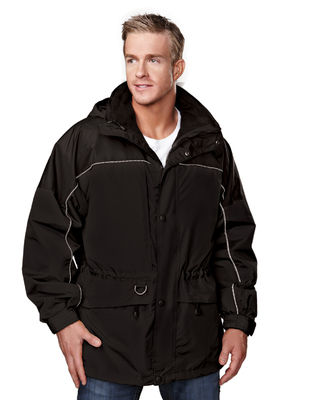 Water-resistant garments are also available along with truly waterproof outerwear for wet or snowy climates. High-end resort hotels typically provide valet services for their vacationing customers. Sharper Uniforms has a full line of valet gear to choose from, including reflective polo shirts and all types of reflective outerwear. 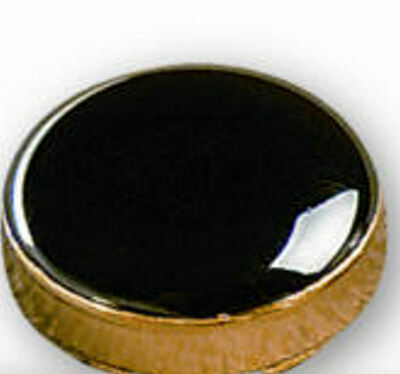 Keep your valets safe at night by helping make them easier to see in reflective clothing. Another asset to Averill's hotel uniform line is that Sharper Uniforms provides many hotels with iron-free hotel apparel. These also can be washed in home type washing machines, placed in the dryer on low heat, removed when slightly damp and hung with fantastic results. Many hotels will provide shorts and pants for their entire staff so they can dress according to the weather. 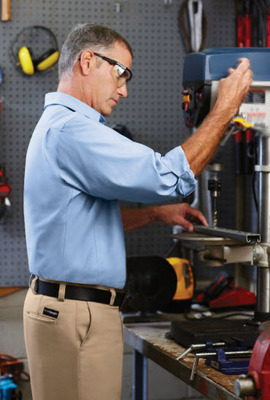 The current pant and short trend has veered away from pleated pants and is now leaning toward flat front pants. Many pant fabrics are made from no-iron microfiber with a waist line that can stretch and flex due to an elastic mechanism sewn in at each of the hips. Hotel employees are constantly on the move across the property, and the added elastic feature is greatly appreciated by the staff. Hotels can be challenging when it comes to outfitting your staff. As mentioned, there are many different departments in a hotel, each with their own unique needs. From housekeeping staff and spa staff to the restaurant workers and the front desk, there are many employees working together to create a pleasant experience for guests and each of those employees require a different uniform. Luckily, with Sharper Uniforms, you can get all of your hotel uniform shirts and resort front desk uniforms in one place. At Sharper Uniforms, we carry a great selection of restaurant uniforms, catering uniforms, spa uniforms, front desk uniforms, maintenance uniforms, housekeeping uniforms, ties, aprons, accessories and more, so that everyone in your staff can be outfitted professionally and comfortably for their position. We offer many resort hotel uniform styles for both men and women, and in some cases, you can get your hotel uniform pants hemmed for free! 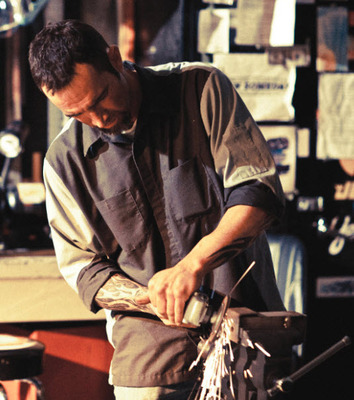 Want something custom made? Have special needs for your hotel uniforms, aprons or accessories? Give us a call toll free for assistance: 1-877-284-1761. 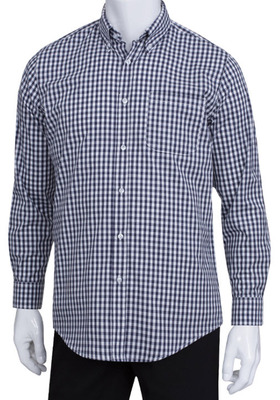 This is what work wear shirts were meant to be, comfortable yet rugged, this is what the Wrangler brand is all about. 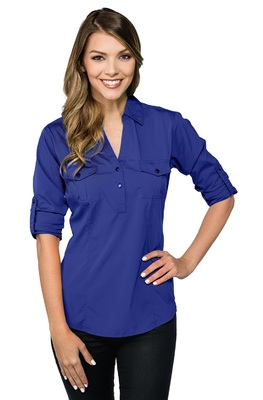 This newest addition is a soft touch, hard working twill shirt that is wrinkle and stain resistant!